It may not be wedding season in the northern hemisphere, but in Jamaica, it’s always wedding planning season. With a temperate year-round climate, adventure-packed destinations, and swoon-worthy scenery, planning a destination wedding has never been easier. We’ve got the what, where, when, and why for planning your Caribbean nuptials—all you need to decide is who you’ll invite! Beautiful scenery, stunning beaches, and the perfect spot for celebrations both large and small. 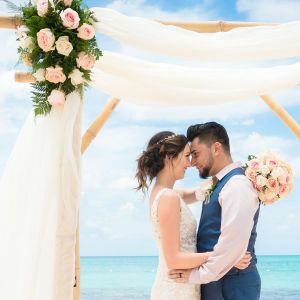 There are a million reasons to say to say “I do” beside the tranquil blue of the Caribbean Sea, and thousands of islands to tie-the-knot on, but we’re of the humble opinion that the some of the best times are had in Jamaica. Jamaica offers a little bit of everything in one package. It’s only fitting, as this is also the birthplace of the all-inclusive resort. Each trip to this verdant island offers an authentic and dynamic experience that can have you bobsledding down a mountain one day and sunning on Negril’s Seven Mile Beach the next. Dig into some jerk BBQ, spend the day sailing, and let the pulse of reggae summon you to the dancefloor. With exceptional airline and cruise port access, grand resorts and quaint boutique hotels, the number of ways to get away and stay in the land of One Love is unlimited. Montego Bay and Ocho Rios offer electric nightlife, fantastic restaurants, and a number of all-inclusive resorts for bigger bashes and groups seeking action-packed days. Negril gives off a casual vibe. With shops and resorts that dot top-rated Seven Mile Beach and boutique hotels that cling to Negril’s craggy cliffs, it’s a tropical getaway that’s never far away from a sunset bonfire or gourmet meal. Think barefoot on the beach with your love and 50 of your closest friends and family. 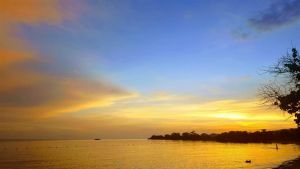 The sunsets here are legendary, so plan a late afternoon ceremony to fully capture the magic of Negril. 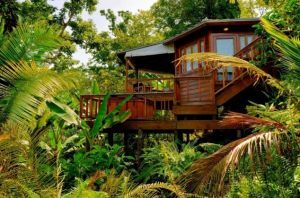 On the northeast coast, Port Antonio offers a quiet retreat for nature lovers with rustic surroundings. Waterfalls, the sea, and the mountains are all within minutes reach. Spend your honeymoon in serene seclusion or skip the big show altogether and elope in this magical part of the island. Dive into fun – Covered with a layer of lush tropical foliage, Ocho Rios offers shopping, dining, beaches, and most importantly Jamaica’s best-kept secret—the Blue Hole. 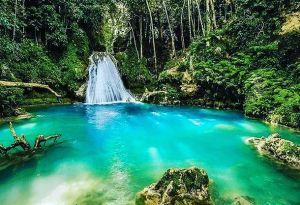 Take a scenic drive to these secluded and nearly untouched falls surrounded by lush greenery and exotic flowers. Plunge into tranquil blue waters from the surrounding cliffs, explore an underwater cave, hike the trails, or enjoy a private moment under the falls with your hubby to be. Step Back in Time – Montego Bay is home to one of Jamaica’s most stunning and spooky national monuments. 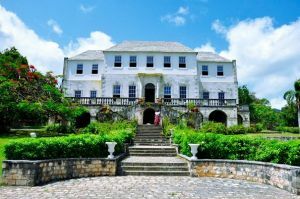 The Great House at Rose Hall Estates is a showcase of colonial architecture that hides a dark past of murder, mystery, and magic. Grab your wedding party and learn about the home’s former governess and resident spirit Annie, the White Witch of Rose Hall, as you walk the mahogany stairs down to the coral stone dungeon. Legend has it this is where Annie tortured her slaves. Sound familiar? Johnny Cash’s “The Ballad of Annie Palmer” is about this twisted tale. Cruise the Caribbean – Weddings cans be stressful, for you, your wedding party and everyone involved. 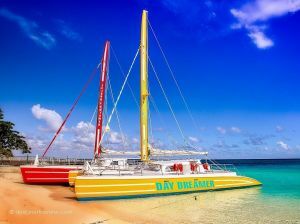 What better way to unwind than a day of fun on the water with your crew, some brews and the sweet pulse of reggae on a catamaran cruise tour. Work on your tan as you sail between destinations, stopping to snorkel, snack, and hop on the aqua park at Margaritaville Caribbean Montego Bay. Your own private club on the water, this luxury boat tour is the ultimate Caribbean experience. Wedding Ceremony – Keep it light and breezy. Ladies, including the bride, should look for lightweight fabrics like chiffon, organza, lace, even cotton blends that flow and are not clingy. Ocean breezes are real girls, so keep dresses tea length or longer to avoid disaster. Guys should stick to the basics. Think linen and cotton, button-down with slacks and a vest or linen suit jacket to keep it a little more formal. And, guys—leave the shorts at home today. The bridal party might want to consider flat or wedge shoes should the wedding not be inside or on a solid surface like a pier or gazebo, while the groomsmen should go for a spiffy deck shoe for comfort and ease. Pro Tip: The same attire principles apply to fine dining restaurants on the island, so pack a few fancy outfits. Outdoor Excursion – Layers are your friend when heading on a day-long excursion in Jamaica. 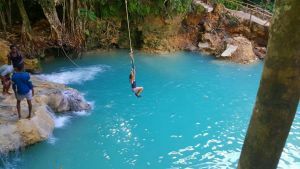 You’ll likely be traveling through the jungle, visiting beaches, diving from cliffs, and hiking mountains and waterfalls. Shorts and a t-shirt over your swimsuit are your best bet and be sure to wear comfortable sneakers or aqua shoes that can grip slippery surfaces and take you from trail to water in a pinch. Add a baseball cap, sunnies, and a backpack to hold your camera, cash, and snacks, and you’re good to go. 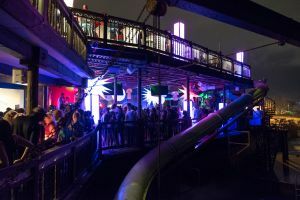 Clubbing – Welcome to Jamaica’s hottest nightlife—Margaritaville After Dark. Our Negril, Montego Bay, and Ocho Rios locations all feature award-winning club nights throughout the week. From beach and pool parties to all-night dancing with some of the Caribbean’s best DJs and entertainers, you’re going to need some versatile attire. Ladies, this is your chance to break out the miniskirts and body con dresses you packed, while men can don a nice pair of slacks or jeans and a fitted t-shirt or button down. There is a dress code, so make sure to check out the link above for details. Thinking about your Jamaican destination wedding? Margaritaville Caribbean offers bachelor and bachelorette party group event packages, daytime fun, and the best nightlife on the Island. Our employees are locals with all the hot tips, so reach out and start planning your Caribbean getaway today.